Hi guys! It's finally Friday! I just received my order from Pahlish a couple days ago, but I thought I'd finally be proactive and show the limited edition duo that will only be available through February. That gives you a couple days to get your order in if you are interested. Let's look closer. Mother Yackle is a lavender purple creme. The blue stands out quite a bit so maybe it's between a lavender and periwinkle color. 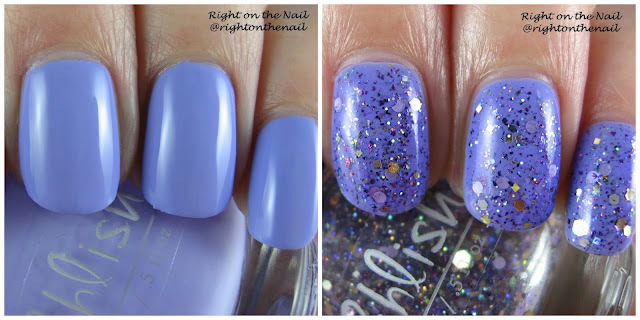 I know several other bloggers got away with just 2 coats of this, but I ended up having to use 3 coats. The consistency was nice and smooth otherwise. The Grimmerie is a glitter and multichrome flakie topcoat that would work over any base color. For whatever reason, Mother Yackle got a little darker with the addition of The Grimmerie, but this is common and not a quality control problem with the polish. The swatches show 2 thin coats of The Grimmerie, but I think I should have just used 1 coat (I wanted to show you guys as much of the glitter and flakes as possible). The flakes go on well with full brush strokes, but the glitter needs to be dabbed so I used both methods per coat. As I said before, you can get this duo for $18 until Feb. 29th so act now! Find out more about Pahlish on their website, Instagram, and Facebook pages.